Wow, this awesome project looks like something you’d see in pro-environmental design Singapore with its highrises, beautifully landscaped park, and living architecture, right? But it’s not – the lucky location is in the New York City borough of Queens. 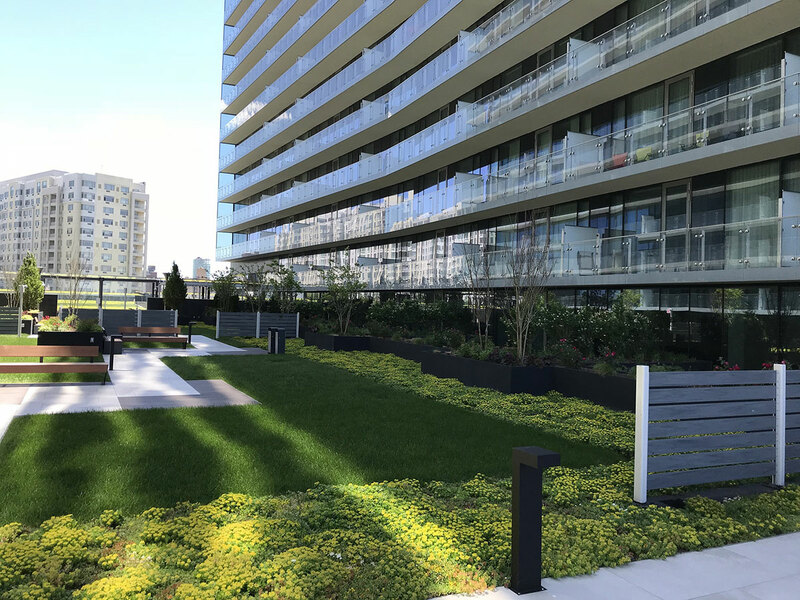 Due to its undeniable scale and multi-color presence, the distinctive Sky View Parc green roof benefits not only condominium’s residents and the environment, but developers and marketers, too. 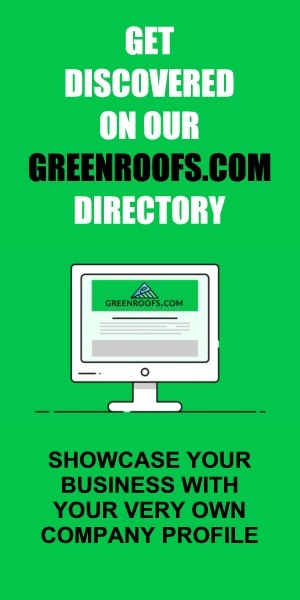 It’s as a great sales tool for eco-friendly design! 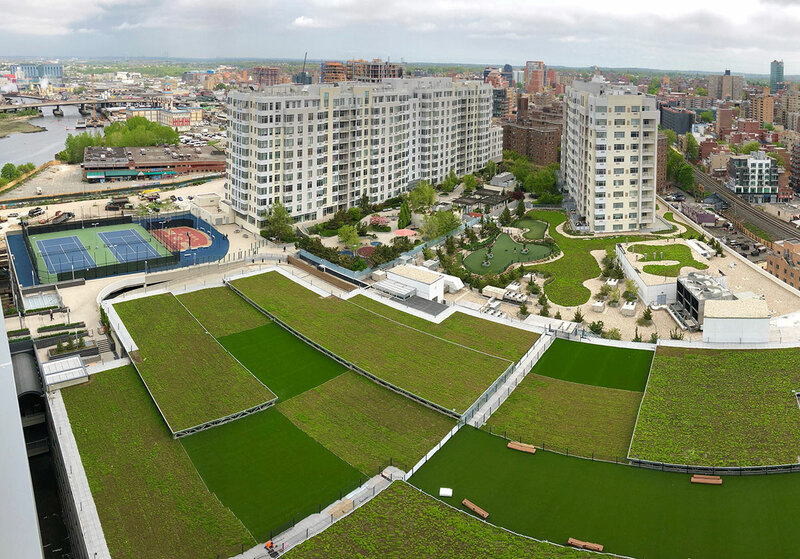 Sky View Parc boasts NYC’s second largest green roof stormwater sponge, utilizing a purple-roof greenroof system from Sempergreen Moerings USA. 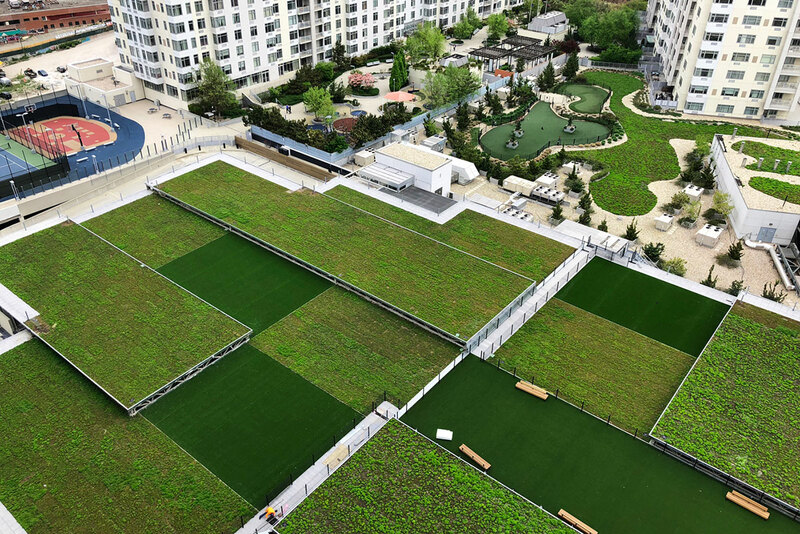 The entire roof top for the entire project (Phase I and II) was designed by Moss Gilday Group. Buildings for first phase was designed by Perkins Eastman and the second by architectsAlliance. 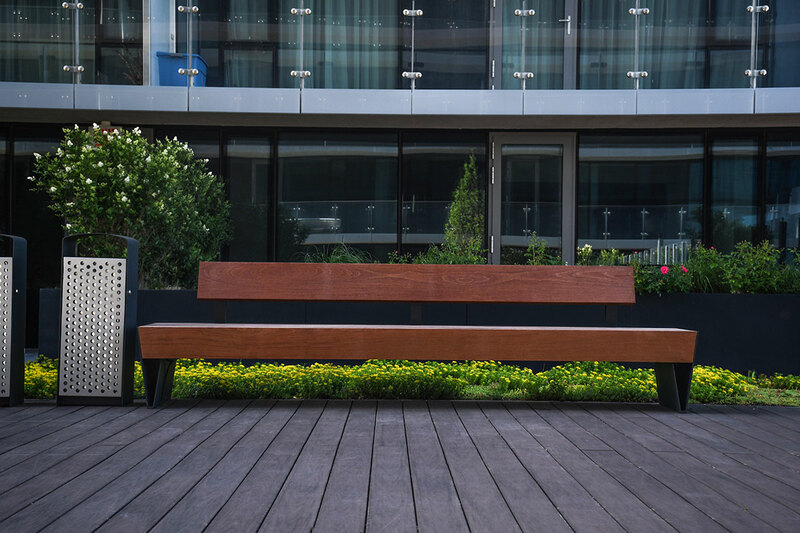 The impressive Sky View Parc offers amazing views of Manhattan, a health club and spa that connect to the rooftop which includes outdoor sports, as well as a 55,000 sf multi-level green roof on top of the parking garage. 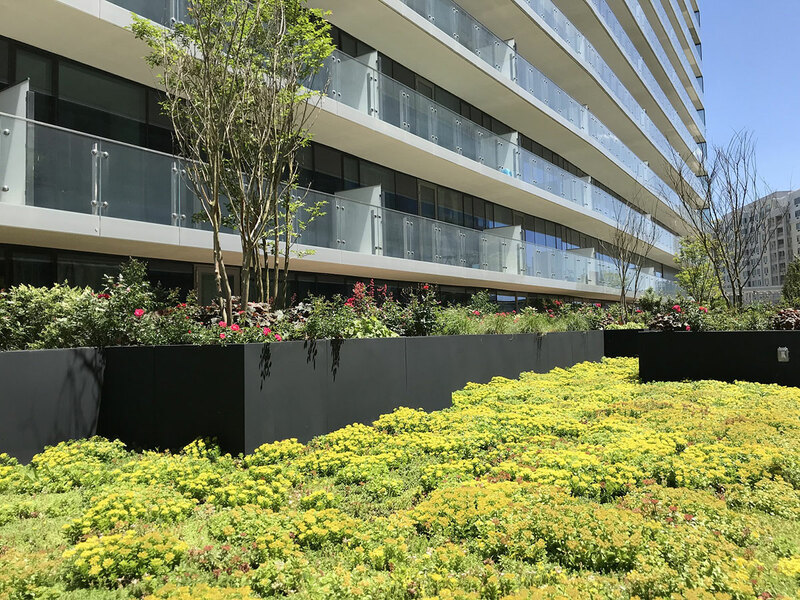 The building design incorporates a large stormwater storage tank to retain and detain stormwater, and is well-integrated with the landscape design to offer significant garden spaces and recreational areas for the residents to swim, barbecue, relax and enjoy. 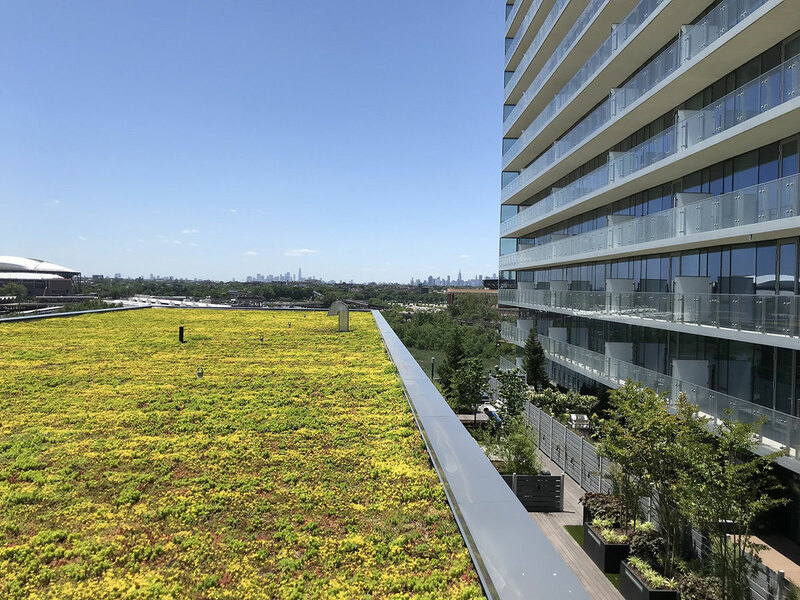 The roof creatively disguises the entire upper level of the 2,500 car parking garage with the vegetated roof, which was the final rooftop component connecting the east and west podium residential towers. 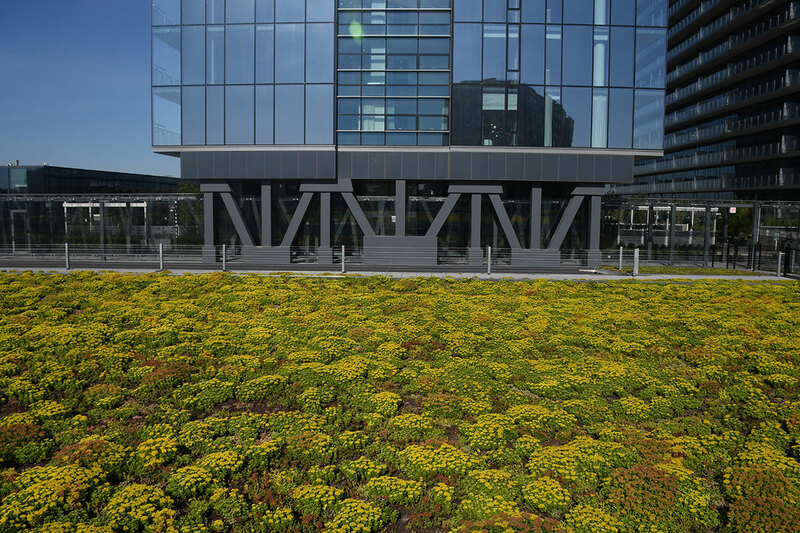 Sempergreen Moerings USA supplied Sedum mats offering a range of color variations. The terraced effect, combined with the ground level park and other green amenities, creates a cascading waterfall of vibrant green. Installation by Blondie’s Treehouse took place in the middle of winter requiring a dedicated team of 20 lasting almost 3 months. Lack of staging space required creative storage and delivery planning including transporting 700 cubic yards of rooflite®’s Extensive 600, the ultra-light growing medium. As the most visible exterior feature of the new luxury development, the success of the striking Sky View Parc has already led to further investment and infrastructure plans in the area. View the Sky View Parc project profile to see ALL of the Photos and Additional Information about this particular project in the Greenroofs.com Projects Database. 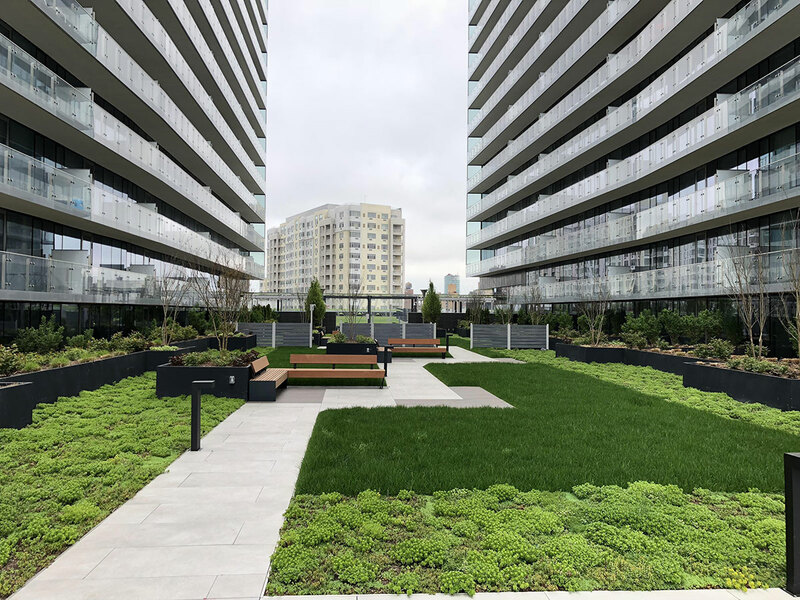 Watch the Sky View Parc Featured Project Video above or see it on our GreenroofsTV channel on YouTube. Did we miss your contribution? Please let us know to add you to the Sky View Parc profile.